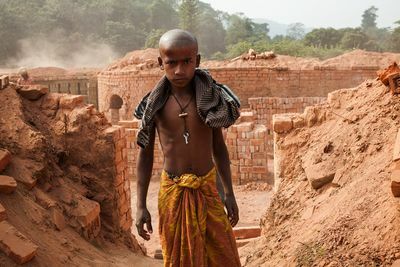 A boy is working in a brick field. 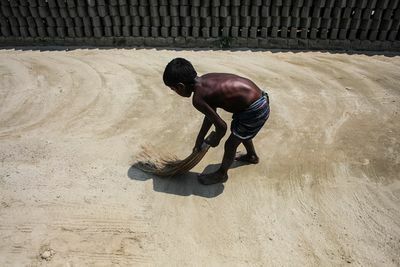 A boy is working in a brickfield only for $1.5 where adult people work for its double. According to the law, no brick fields can be set up within five kilometers from residing areas but these regulations are not followed. Many fields are next to houses and schools, such as this one, which is right outside a village. Bricks are the most efficient and widely used building material and new brick buildings are erected across the country. Kushtia, Bangladesh. January 2013. 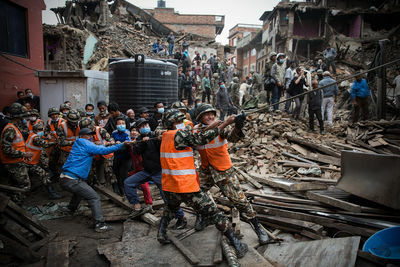 Bangladesh is one of the countries in the world that's hit hardest by climate change. 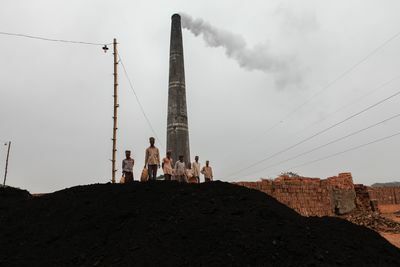 Lowering the level of carbon emissions ought to be top priority. Bricks are the most efficient and widely used building material and new brick buildings are erected across the country. Kushtia, Bangladesh. January 2013. 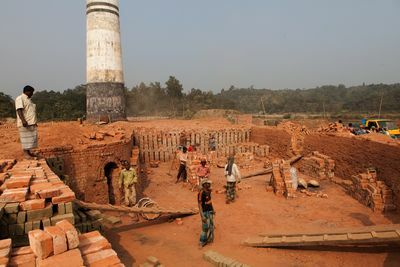 The cities of Bangladesh are growing fast and there's a never-ending need for cheap and available construction material. Bricks are the most efficient and widely used building material and new brick buildings are erected across the country. Kushtia, Bangladesh. January 2013. Brick fields are dispersed throughout the country. Many can be found in the midst of valuable forests or environmentally sensitive areas, like Cox’s Bazaar or Rangamati. The cities of Bangladesh are growing fast and there's a never-ending need for cheap and available construction material. Bricks are the most efficient and widely used building material and new brick buildings are erected across the country. Kushtia, Bangladesh. January 2013. 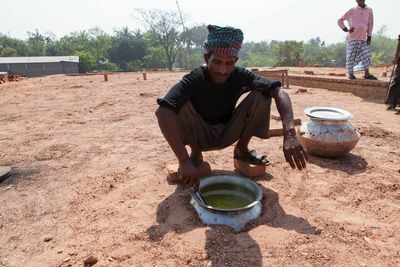 A man uses the heat generated from the kilns to cook lunch. Workers often live together on the site. Food is cooked and eaten communally. 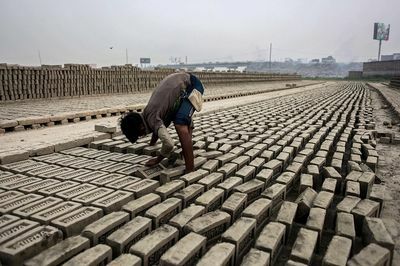 The cities of Bangladesh are growing fast and there's a never-ending need for cheap and available construction material. Bricks are the most efficient and widely used building material and new brick buildings are erected across the country. Kushtia, Bangladesh. January 2013. To a large extent, women have been leading Bangladesh's development. In both public and family life, women have taken on a new economic role, and are increasingly impacting decision-making processes. Savar, Bangladesh. January 2013. Many of the Bangladesh's ancient cities were made entirely out of bricks. 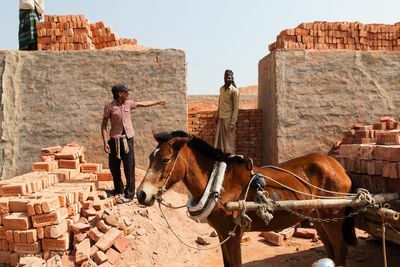 The cities of Bangladesh are growing fast and there's a never-ending need for cheap and available construction material. Bricks are the most efficient and widely used building material and new brick buildings are erected across the country. Faridpur, Bangladesh. January 2013. Establishing a brick field is a straightforward process which makes it attractive for investors because it does not require lots of experience. 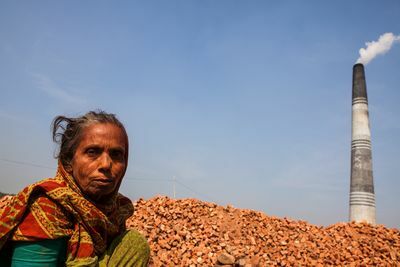 The cities of Bangladesh are growing fast and there's a never-ending need for cheap and available construction material. Bricks are the most efficient and widely used building material and new brick buildings are erected across the country. Faridpur, Bangladesh. January 2013. 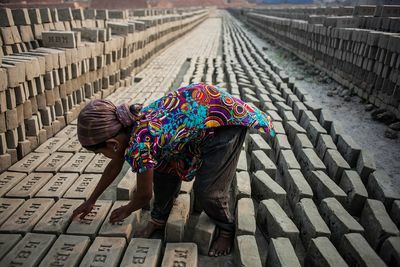 Women often do monotonous work and suffer from illnesses related to bad working conditions. One specific problem is diseases in the reproductive organs, which are caused by long hours spent squatting in the same position. Faridpur, Bangladesh. January 2013. 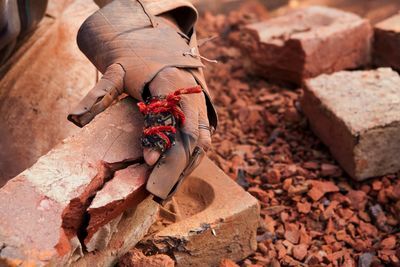 Most work on the fields is done manually, from digging up the mud to forming the bricks, leaving them to dry and burning them in large kilns. Bricks are the most efficient and widely used building material and new brick buildings are erected across the country. Bandarban, Bangladesh. January 2013. 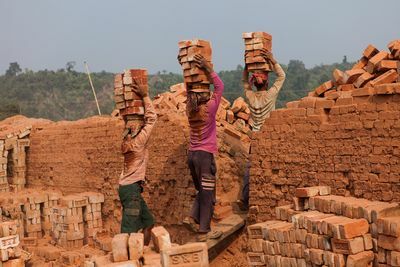 During recent years, brick making has expanded rapidly in Bangladesh, especially in the area around Dhaka. Today, there are over 10 000 fields in the country – a doubling from ten years ago. Bricks are the most efficient and widely used building material and new brick buildings are erected across the country. Bandarban, Bangladesh. January 2013. Many workers come from rural areas where agriculture no longer can provide for the growing workforce. Bricks are the most efficient and widely used building material and new brick buildings are erected across the country. Bandarban, Bangladesh. January 2013. 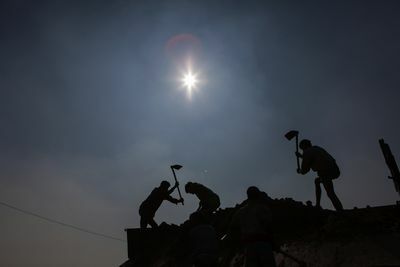 The workers work only six months per year: during the summer monsoon months, no bricks can be produced. Bricks are the most efficient and widely used building material and new brick buildings are erected across the country. Bandarban, Bangladesh. January 2013. The workers' salaries differ. 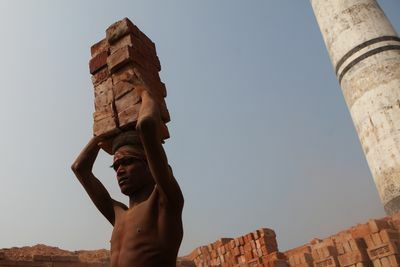 The more bricks they carry or burn in the kilns, the more they get paid. Bricks are the most efficient and widely used building material and new brick buildings are erected across the country. Bandarban, Bangladesh. January 2013. Traditional brick fields like this one produce around 5,000 bricks per day. 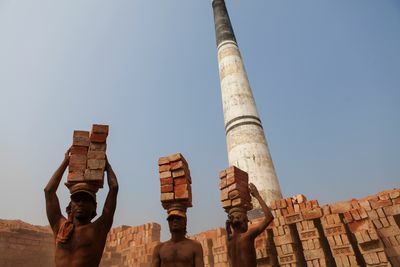 The new, more efficient, kilns can produce up to 40,000 bricks per day, according to UNDP. The cities of Bangladesh are growing fast and there's a never-ending need for cheap and available construction material. Bricks are the most efficient and widely used building material and new brick buildings are erected across the country. Bandarban, Bangladesh. January 2013. 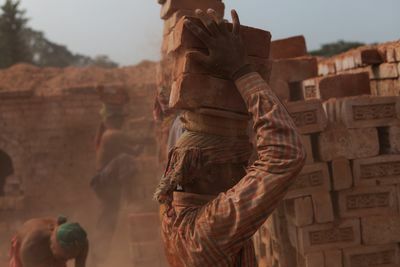 Many workers suffer from bronchitis or coughing because of the dust generated in the brick-making process. 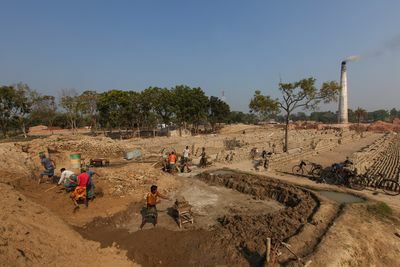 The cities of Bangladesh are growing fast and there's a never-ending need for cheap and available construction material. Bricks are the most efficient and widely used building material and new brick buildings are erected across the country. Bandarban, Bangladesh. January 2013. Many children like Shuhun work in the fields alongside the grownups. 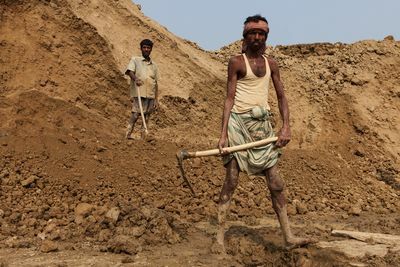 Often, they take care of forming the mud into bricks using metal and wooden forms. Bricks are the most efficient and widely used building material and new brick buildings are erected across the country. Bandarban, Bangladesh. January 2013. 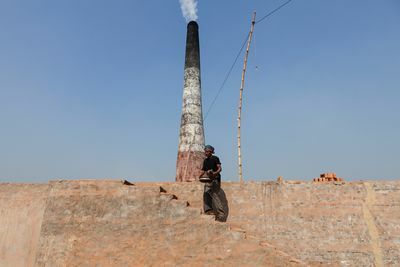 The government was supposed to stop issuing licenses to traditional kilns by September 2012, but most brick fields are still using old methods that continue to pollute the environment. Bricks are the most efficient and widely used building material and new brick buildings are erected across the country. Bandarban, Bangladesh. January 2013. 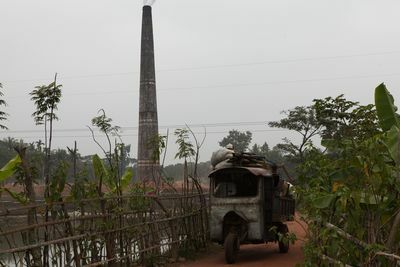 The brick fields are the largest emitter of greenhouse gas in Bangladesh. More than 6.4 million tons are generated each year by the industry. Bricks are the most efficient and widely used building material and new brick buildings are erected across the country. Jhalakati, Bangladesh. January 2013. 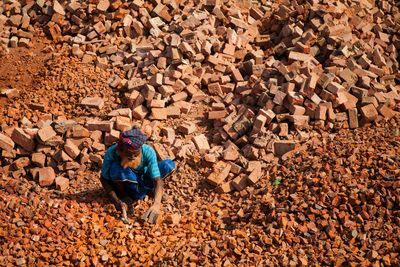 Today, brick making is Bangladesh's fastest growing industry. Its popularity is partly due to the fact that it's so easy to start up a field: a small piece of land and between 40-50 000 taka ($500-$650) is all that's needed. The revenue within six months is up to five times that amount. Jhalakati, Bangladesh. January 2013. 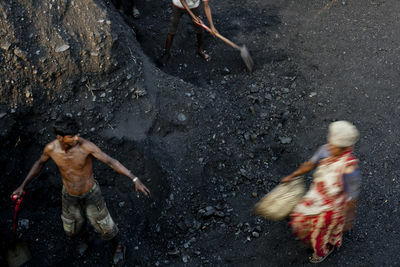 Bangladesh has the second worst air pollution in the world, according to the 2012 Environmental Performance Index. 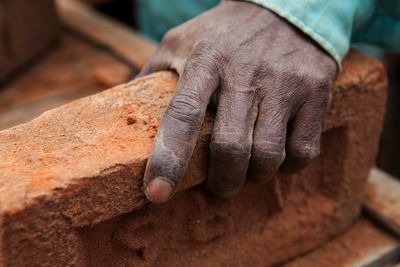 One of the biggest contributors to the unclean air is the brick-making industry. 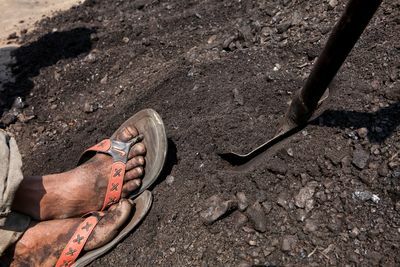 Most fields use coal or wood to burn the bricks, both of which are very bad for the environment. 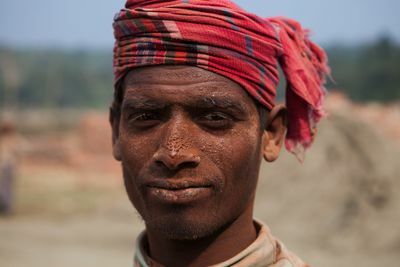 Jhalakati, Bangladesh. January 2013. 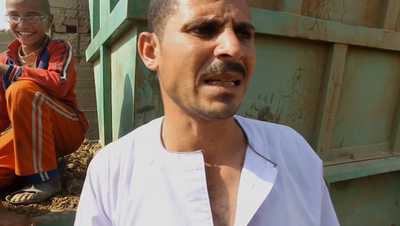 A Transterra Special with journalist Beesan Odwan about brick factories outside of Cairo. 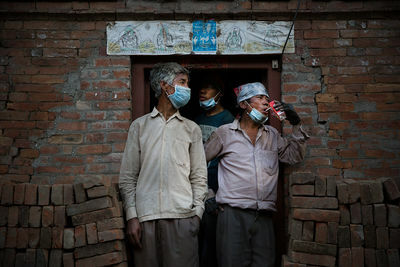 The effects on environment and the health of the workers.